Don't BUY it, MAKE it! | I made that! 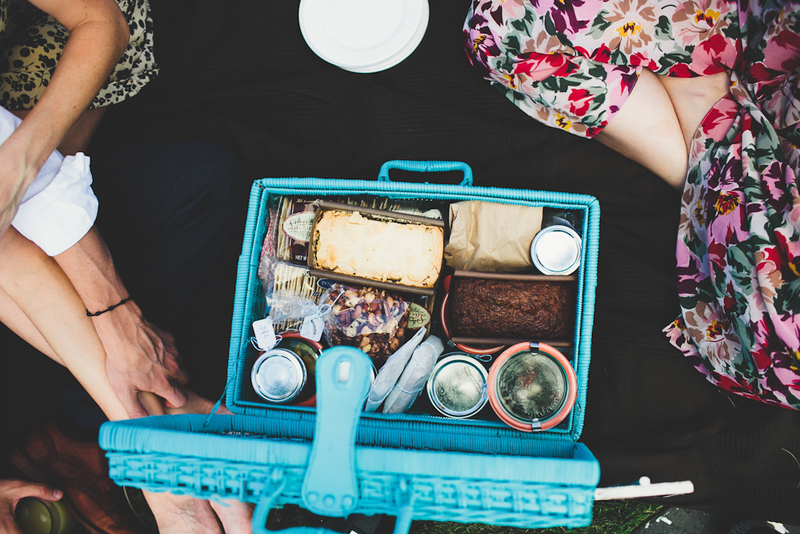 How to picnic like it’s your wedding day. So this year was a big one for me. 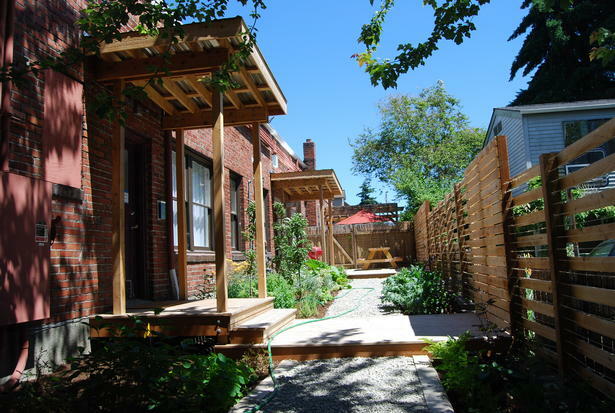 The Pantry turned one, I finally went to Canada, and after dating for 6 years, me and John got married. I know, I know: A) this post is over due (sorry, yet again!) and B) It’s frickin’ Thanksgiving, all you want to hear about is another variation on sweet potatoes and brussels sprouts. 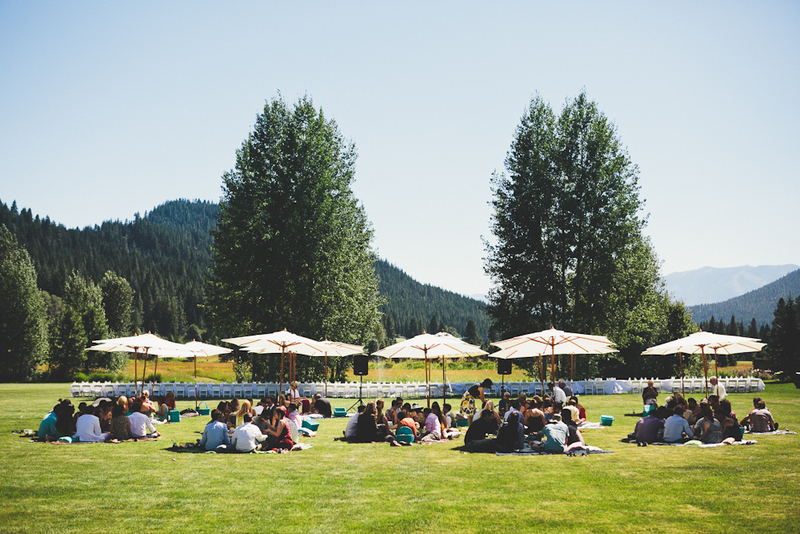 But think of this as a holiday oasis post, a place you can come to forget about the will-it-EVER-stop rain (if you live in Seattle) and instead remember summertime, picnic blankets, sundresses and adorable foods on crackers. It was a gorgeous August weekend in the Cascade Mountains, 80 degrees and sunny, with the crisp waters of Lake Wenatchee a five minute drive away. It was a weekend filled with friends, singing, dancing, and of course, whole lot of food. I was never going to be a traditional bride — white ball gowns and pretty pictures of me gazing into the sunset are definitely not my thing. And I’ve got plenty of political ideas about marriage and taxes and civil rights that have kept me from taking the idea of a wedding seriously for most of my life. 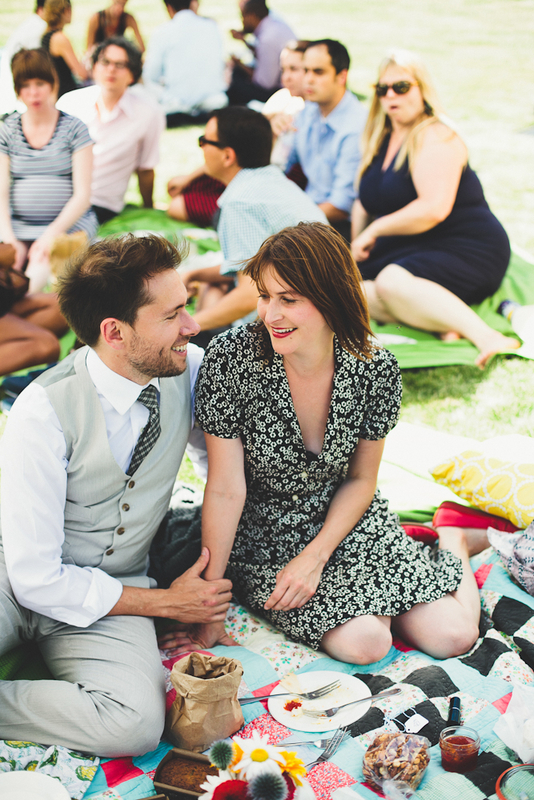 It really took a mental shift, reframing the idea of a wedding ceremony to get me on board. It doesn’t have to be about poofy dresses and until sickness and death parting us, or about weird beef dishes from the 60s and the electric slide. It can be about friends. And our rather tiny families. And celebration. And where there’s celebrating, there’s food. And board games. And lawn games. And a lemonade stand. And midnight re-enactments of frogger with hacky sacks. And karaoke with lots of dancing. 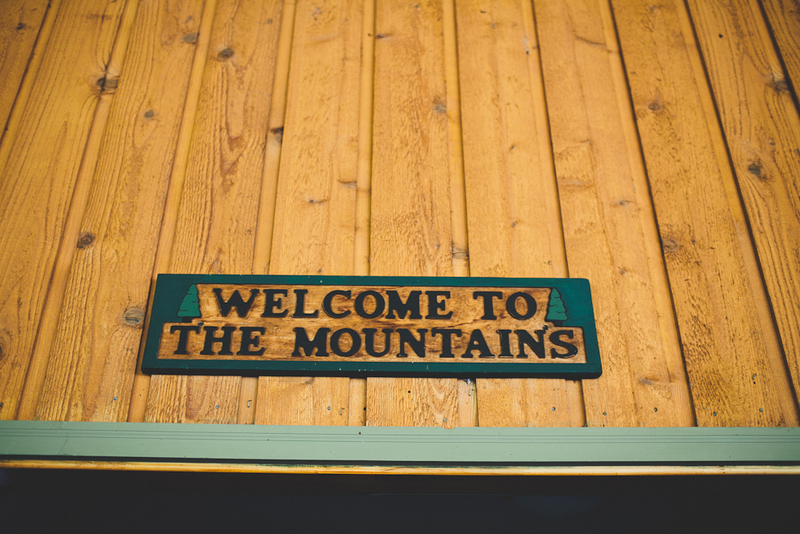 Since so many of our guests were coming from far away, we wanted the wedding to to take over a weekend, giving us as much quality time as possible — and, of course, providing us with plenty of opportunities for meals. I like to dream big, and I’ve never met a culinary challenge that was too intimidating. 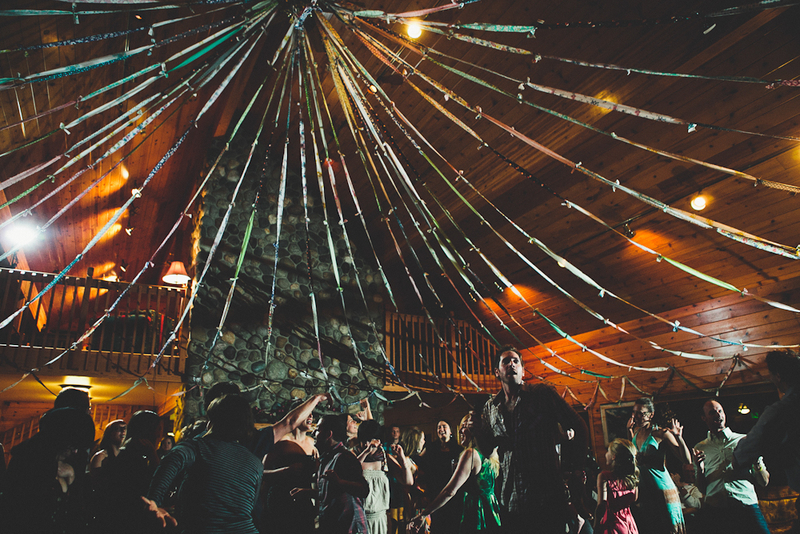 So as you can imagine, the days leading up to the wedding were slightly insane. 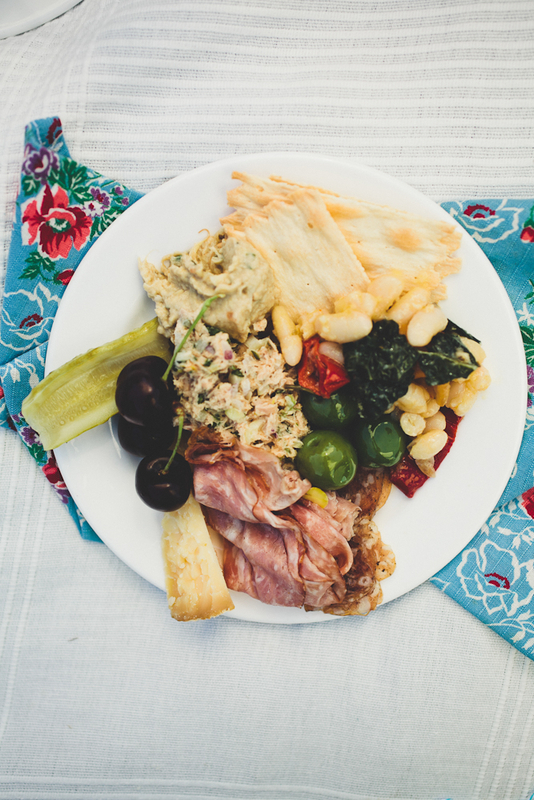 I am forever indebted to all my friends who spent many hours cooking, pickling, packaging, and labeling all the food that would become welcome snacks for our guests, breakfast baskets that got delivered to everyone’s cabins, and finally make it into the main event: a wedding picnic in the mountains. We spent months scavenging for picnic baskets, vases and picture frames at the thrift stores, and then painted them all bright aqua blue. 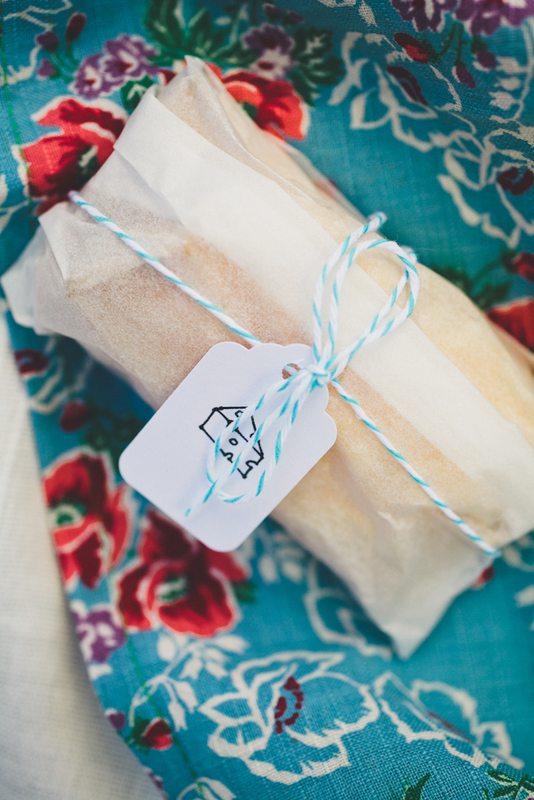 We filled them with all of our favorite things, and sewed napkins, streamers and pillows out of vintage fabric I found at my great-grandmother’s house in Alabama. Actually full credit for napkin sewing goes to Mariah, my close friend and inspiration for all things domestic, because she didn’t even blink when I dropped a box of vintage fabric on her porch before hopping on a plane back to Seattle. It was not a white wedding. It was bright. It was patterned. And nothing matched. It was perfect. We had olives marinated with rosemary, orange and chile flakes, and herb roasted nuts. A tuna salad with tarragon, fennel and celery leaves, concocted by my business partner Olaiya Land, that pretty much stole the show. Some Olympic Provisions salami and our favorite cheeses: Cowgirl Creamery’s Mt. Tam and Jasper Hill’s clothbound cheddar. 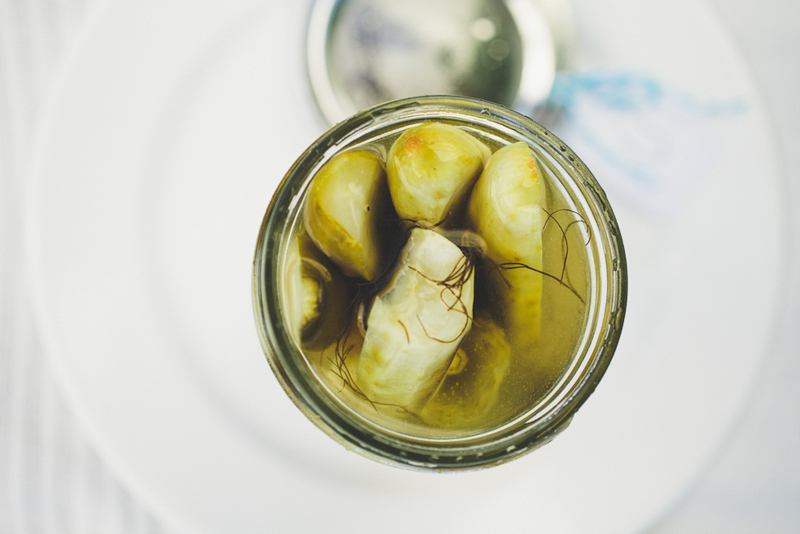 Pickled cucumbers with fennel fronds and some red pepper jelly that my family is still asking about. Smokey baba ganoush, which I think is responsible for keeping me fed the entire weekend, and a white bean and kale salad dressed with a preserved lemon vinaigrette, recipe courtesy of our friends at Picnic. And since I’m a pastry chef and John has an unrivaled sweet tooth, there was plenty of dessert: lemon pound cake and my most favorite banana bread ever, and rhubarb ginger jam made by Rebecca of Deluxe Foods. Three days before the ceremony I let go of the plan to make homemade nutella. It was the right decision. I still think about that weekend. Having everyone with us, being able to feed them. 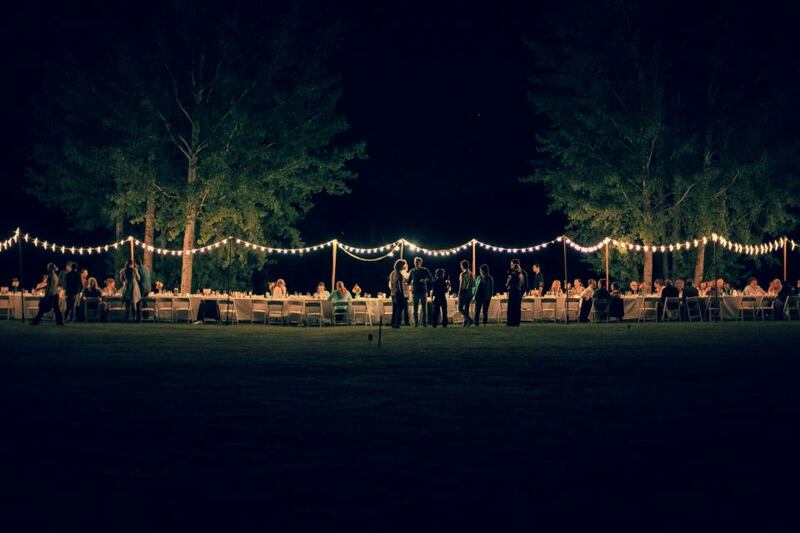 Swimming in the lake, playing kickball in the sun, eating dinner under the stars – I can’t even imagine a different kind of wedding. Thank you to all of my friends, for being there and for being so awesome. And a special thank you to Gabe and Ashley Rodriguez, for taking such beautiful pictures that will make me remember that weekend in visual style. – Using a vegetable peeler, remove zest from orange in long, wide strips. Smash garlic cloves with the edge of a chef’s knife. – Place the olive oil in a small saucepan along with the orange zest, rosemary, pepper flakes and garlic. Warm over medium heat until fragrant but not boiling or simmering. Turn heat to medium-low and add olives. Stir occasionally for about 5 minutes. Do not cook olives. Pour olives and oil into serving dish and accompany with crusty bread for dipping in the oil. 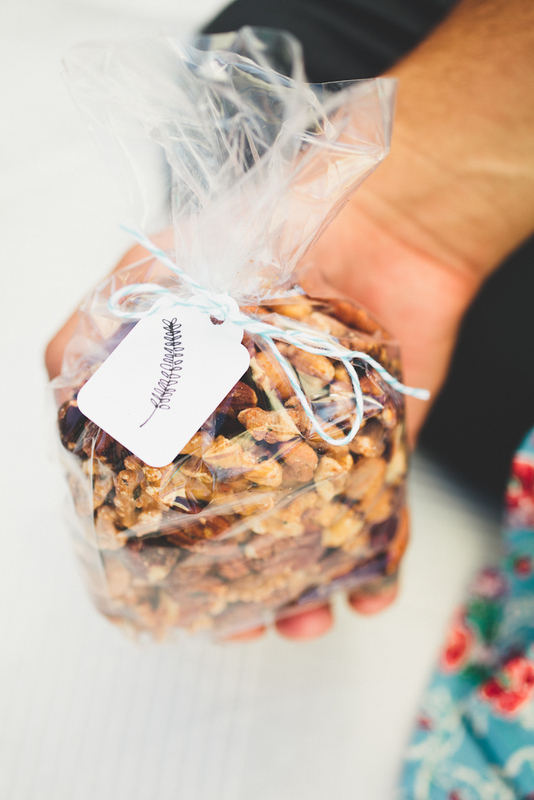 -Toss the nuts in a large bowl to combine and spread them out on a baking sheet. Toast in the oven until light golden brown, about 10 minutes. -In a large bowl, combine the rosemary, cayenne, sugar, salt and melted butter. -Thoroughly toss the toasted nuts in the spiced butter and serve warm. 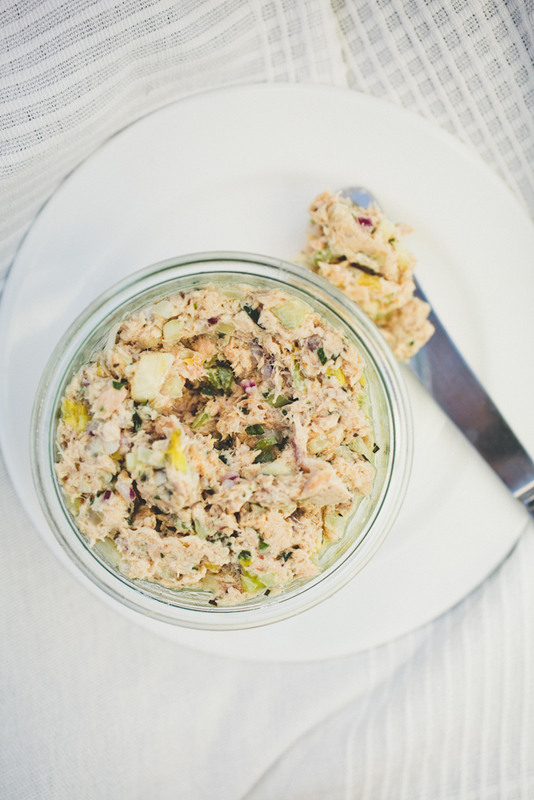 – Break the tuna into rough chunks. – In a medium bowl, combine all the ingredients except for the salt, pepper and sugar. Mix gently, to combine. Season with a generous amount of black pepper and a pinch of salt and sugar, if needed. – Whisk together pectin and 1/4 cup sugar in a small bowl. 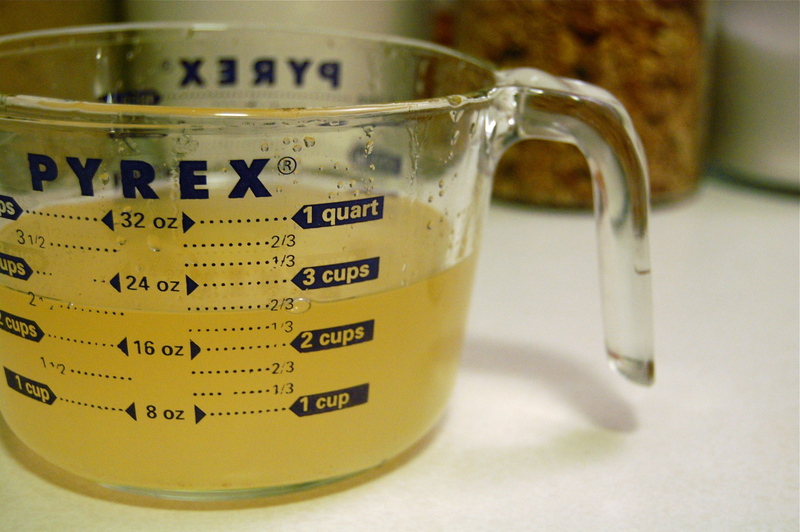 – Stir together pepper mixture, vinegar, butter, salt, and remaining 3 cups sugar in a 5- to 6-quart heavy pot. 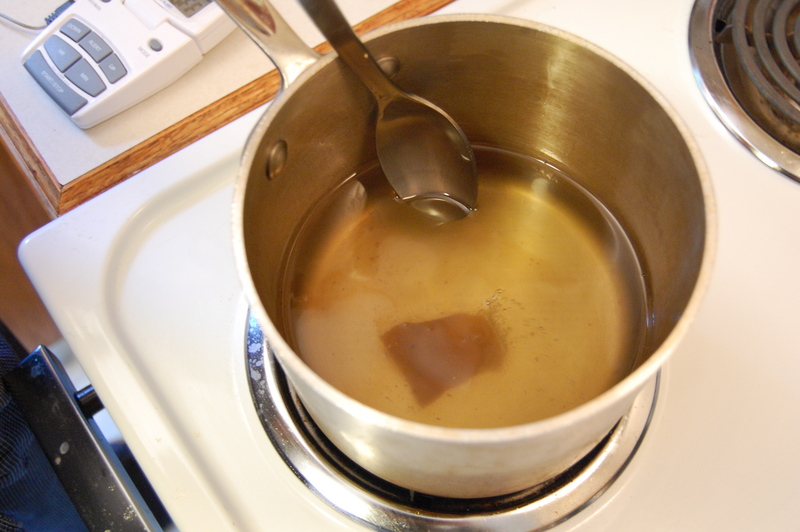 Bring to a vigorous boil over high heat, then continue to boil vigorously, stirring occasionally, 5 minutes. 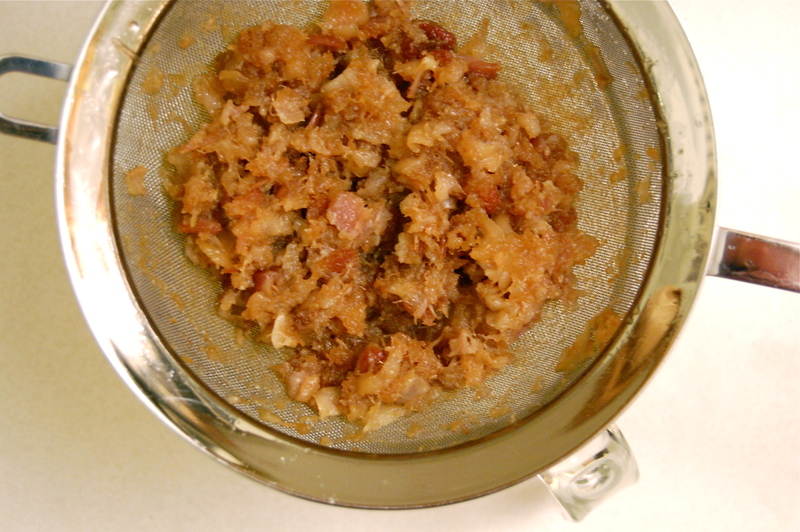 Gradually add pectin mixture, whisking constantly. Return jelly to a vigorous boil, stirring constantly, and boil, stirring constantly, 1 to 2 minutes (mixture will thicken slightly). Remove from heat. – Preheat the oven to 350 degrees (325 conv.). Butter loaf pans and line with parchment. Set aside. – Rub the vanilla bean seeds into the sugar to make a vanilla sugar. Beat bananas and sugar well with paddle, then add the butter slowly. – Add the eggs one at a time. – Sift the dry ingredients and then add. – Spoon into the prepared cake pans and bake until the cakes spring back when touched lightly in the center. Cool before removing from the pan. 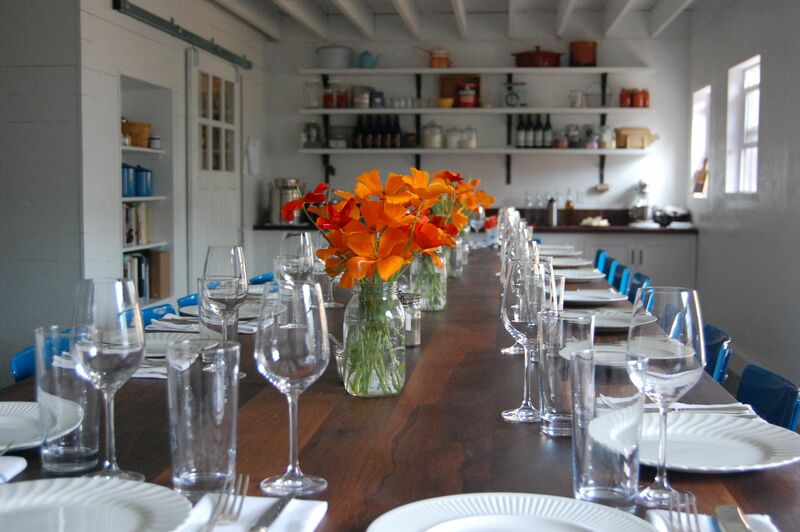 Sunday night we had our first Down South dinner at The Pantry. Boiled peanuts, homemade saltine crackers with pimento cheese and smoked ham, succotash, fried chicken, buttermilk biscuits. I have to admit, it was kind of amazing. Maybe I’m biased to Southern food in general, but there was something beautiful about watching complete strangers sit around the table and get in there with their fingers. The thing that threw it over the edge for me? You know the stuff. It’s pretty. It’s hot. It’s usually that awesome shade of orange that I can never find a paint chip to perfectly match. It makes me drool a little just to think about it. I’ve been buying this one brand, Youk’s, for years. The problem is that they only sell it online or in San Francisco, at this restaurant called Maverick. Needless to say, carting it back to Seattle after every trip got a little tedious. And once you’ve had the good stuff, it’s just hard to go back to Tabasco or Tapatío. If you’re as much a fan of the stuff as I am, then this is a very good day. I made it with my friend Brandon one day, a couple of weeks ago. It was kind of a shot in the dark, involving us poking around on the web for Southern-style recipes, then just winging it. It actually surprised me with how good it is. Who knew I had such little faith in myself? Anyhoo, get yourself to the farmer’s market before the peppers are gone, you’ll thank me. We started by tossing some fresno chiles in olive oil and then roasting them in the wood-fired oven at Delancey for a bit. After they got nice and browned, we pureed them in a food processor with just enough vinegar to make them move around in there comfortably. Then we placed the whole blob of pepper paste in a strainer and smashed it through. We took the liquid that came through and adjusted it with more vinegar, some water and lots of salt. And that’s it. So darn simple. And crazy good. We made about 6 cups of it and have already gone through a quart. In two weeks. There’s been a lot of heartburn at The Pantry this month, but no one’s complaining. – Trim the stems off of the chiles, leaving the base that the stem attaches to. Rumor has it that that part gives great flavor. Who am I to challenge a good culinary rumor? 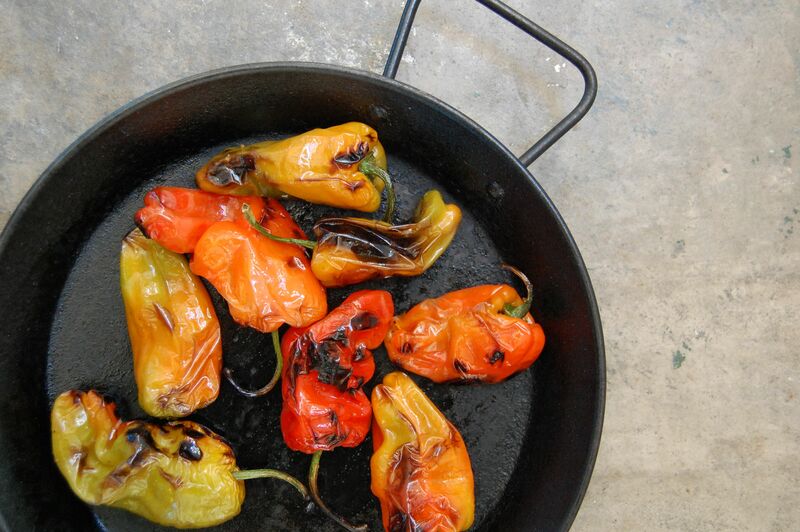 – Toss the chiles in enough olive oil to coat them. Then roast them in a broiler, or grill them if you can. The goal is to get a nice char on them. – Puree them in a food processor or blender with enough vinegar to keep them moving. – Strain them through a fine sieve, smashing the whole time to get as much of the pulp as possible. 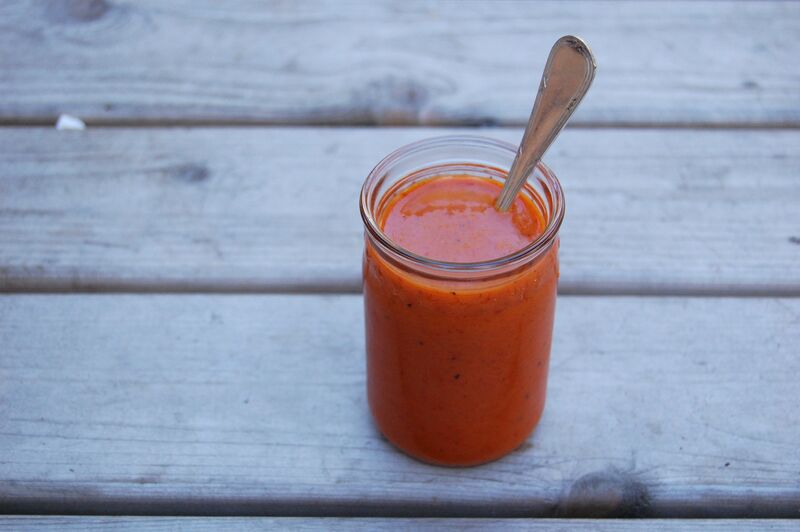 – Add the water, salt and the rest of the vinegar and pop in the fridge to chill for a few days. You can certainly eat it immediately, but it only gets better with time. Okay, time to own up to another guilty pleasure. You might remember a certain love letter, to a certain carnitas, written many a month ago. Well, it is carnitas time again. I mean, when is it ever not carnitas time…. 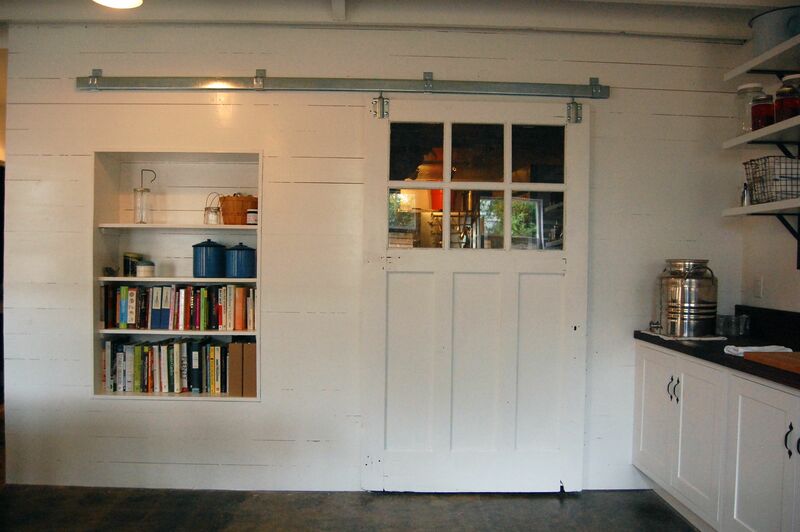 We’ve been hard at work on The Pantry, and there’s nothing quite like building your own business with your bare hands to work up an appetite. We’ve been working so hard, in fact, that I invited my most carnivorous friend Scott to Seattle, to help my tiny little muscles. Because in case you didn’t know this, construction, it is physical. 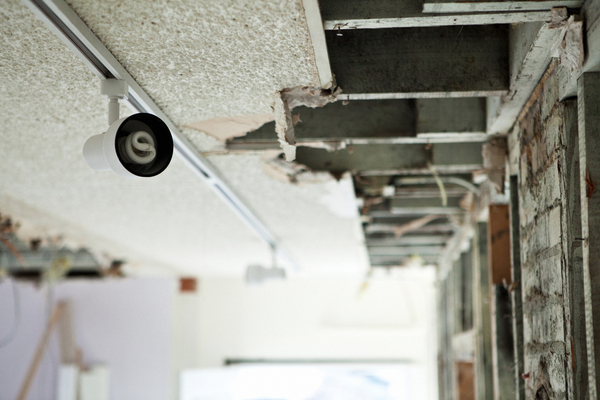 After weeks ripping sheet rock from the walls, nailing boards to form our new ceiling, scraping the linoleum off of the floor to find (gasp!) 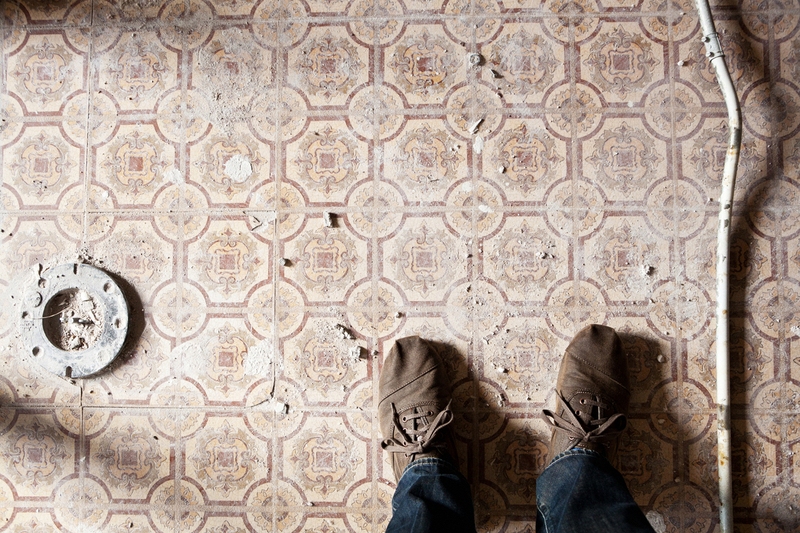 a SECOND layer of linoleum, I found myself with a small bit of time before we start jackhammering (oh yeah, you heard me) the concrete in our future garden. Give me a night off with some of my meat-loving friends, and some porky goodness is sure to show up. Carnitas. That deliciously salty, crispy, sweet, melt in my mouth porkfest was calling. But hold your carnitas, because there’s new tortilla in town. Here’s the thing. I know you’re supposed to like corn tortillas better, because that’s the “authentic” Mexican way. But guess what? I’m not from Mexico. In fact, being from Alabama, I’m doing good just to have graduated past Taco Bell. So I’m here to admit for the world wide web to hear: I like flour tortillas better. Not the stretchy, gummy kind of steamed flour tortillas you get at a taqueria (oh how I miss you, dear Mission district), but something with some chew to it. Blistered from heat and even a little puffy. I could munch on good flour tortillas daily. The problem? 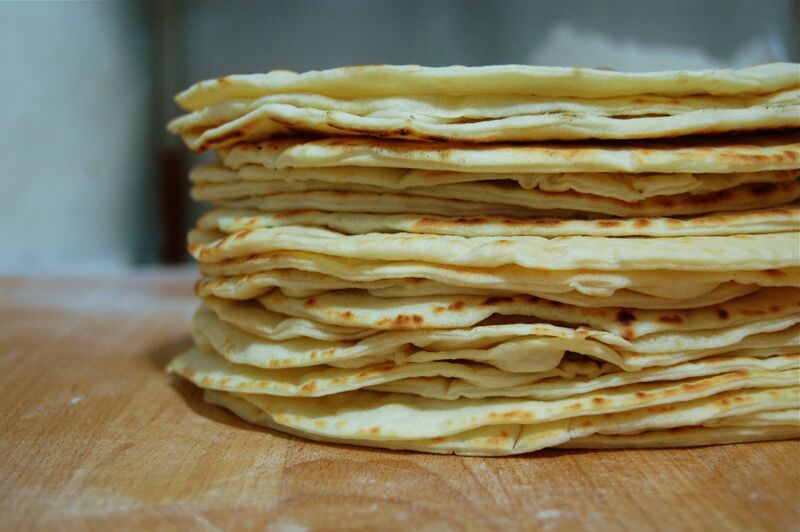 Good flour tortillas are few and far between. As per usual, I thought, why not make my own? So I did. And they were perfection. I now pass the baton to you. A note about lard: If you don’t have time to make your own, then you should be able to find freshly rendered lard at a good butcher shop. Even if you don’t see it, just ask, because sometimes they keep it hidden away. This time I got my lard from Rainshadow Meats on Capitol Hill. – Mix together the flour, baking powder and salt. Add the lard and work in you’re your hands until all of the flour is coated. – Add the warm milk and stir the mixture with a spoon until it forms a dough. Knead for 4 minutes on a floured surface. The dough should be firm and soft. – Place the dough in a bowl and cover with a damp cloth or plastic wrap for 30 minutes. 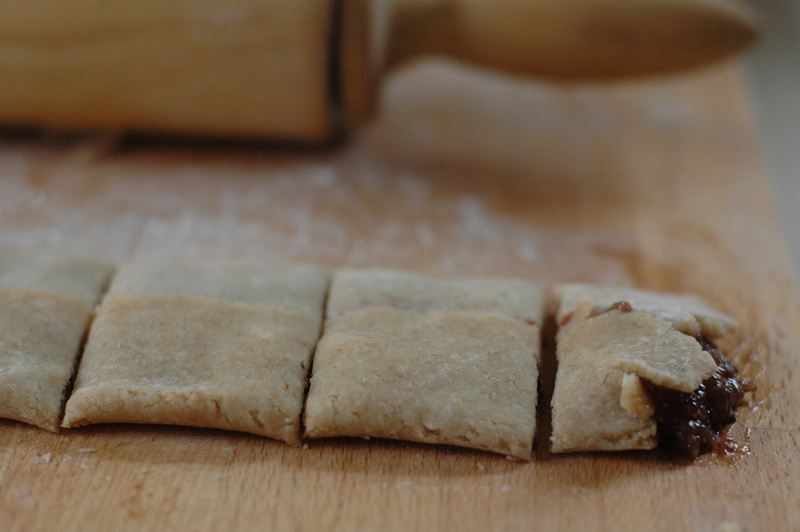 – After the dough has rested, roll it into a log. Slice the log into into eight discs. Use your hand to flatten each disc, then place on a plate without touching each other. Cover the dough with a damp cloth or plastic wrap for 10 minutes. After the dough has rested, one at a time place a piece on a floured surface and roll with a rolling pin from the center until it’s thin and about eight inches in diameter. Keep rolled-out tortillas covered until ready to cook. – In a dry cast iron skillet heated on high, cook the tortilla about thirty seconds on each side. 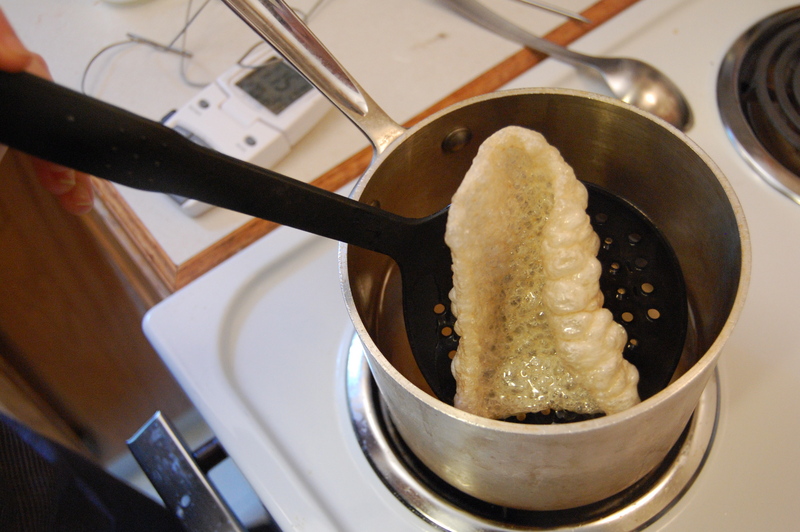 It should start to puff a bit when it’s done. Keep cooked tortillas covered wrapped in a cloth until ready to eat. They can be reheated in a dry iron skillet. First, let me apologize for my absence. December was rough. Fun, but rough. But January is here and I am finally back in the kitchen. When I was itty bitty and carried a lunchbox to school, my mom used to pack it full of yumminess. Well, at the time I thought it was yummy. Though I remember being jealous of my friend Leia’s lunch, because she always had more homemade-type things. Years later she told me she was always jealous of my lunch because I had Little Debbie snacks. Today we both win! I’ve been wanting to recreate these cookies for years, but have been lacking what I thought was a great oatmeal cookie recipe. 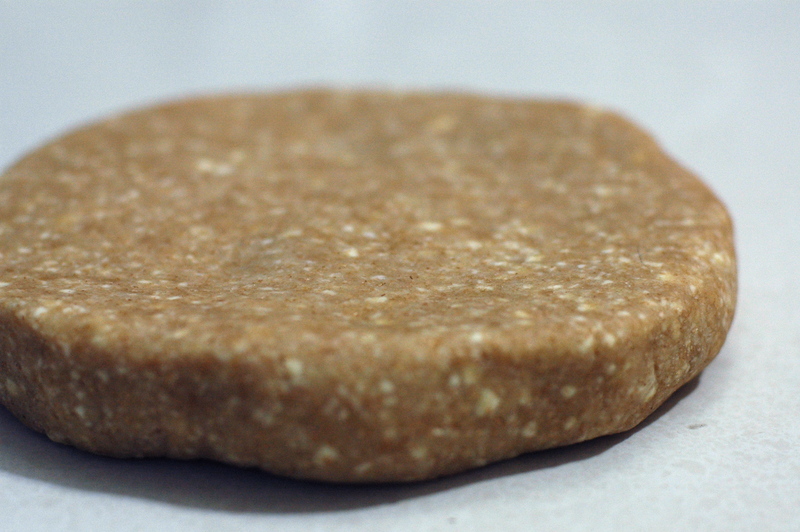 I wanted a thin cookie, one that was chewy enough to hold a soft fluffy filling. After some tweaking, I feel confident in saying that I’ve got it. In this batch I chopped up dates into my dough, but next time I’m thinking currants, because those dates are just too sweet for me! I scooped the dough into little balls. And smashed them down with the back of a wet spoon (wet is important if you don’t want them to stick). This might seem like a meaningless step, but it makes the cookies spread nice and thin. While they were baking, I got to work on the filling. I first tried making a simple vanilla fluff, much like the original. My friend Olaiya happened to swing by at the exact moment I finished and confirmed for me that to make these little guys palatable to adults, I needed some acid. So I decided to go with a lemony filling, to balance out the sweetness of the cookie. I ground lemon zest and half of a vanilla bean into sugar in the food processor until it was nice and crumbly. I mixed the lemon sugar with egg whites and heated the whole thing up before whipping it into a swiss meringue. Into the meringue I folded in some lemon juice. And then I hid it until the cookies were all ready for sandwiching, because nobody needs a giant batch of fluff within reach. 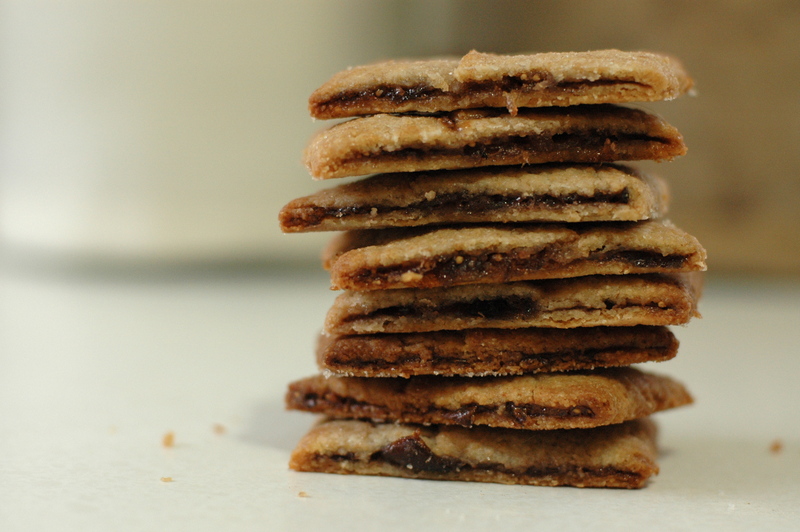 Once my cookies were cooled, I started stacking. It took me a few hours before I was ready to munch on them, because all the snacking during the testing phase kind of blew me out. When it was time though, oh boy was I happy. Little Debbie, you have been one-upped. – Whisk together flour, salt, baking soda and cinnamon. Add the chopped dates and rub to break up clumps. Add the oats. Set aside. – Cream butter for 1 minute. – Add the sugars and cream for 3 minutes. – Add the egg and vanilla and cream for 2 minutes. – Add the dry ingredients. 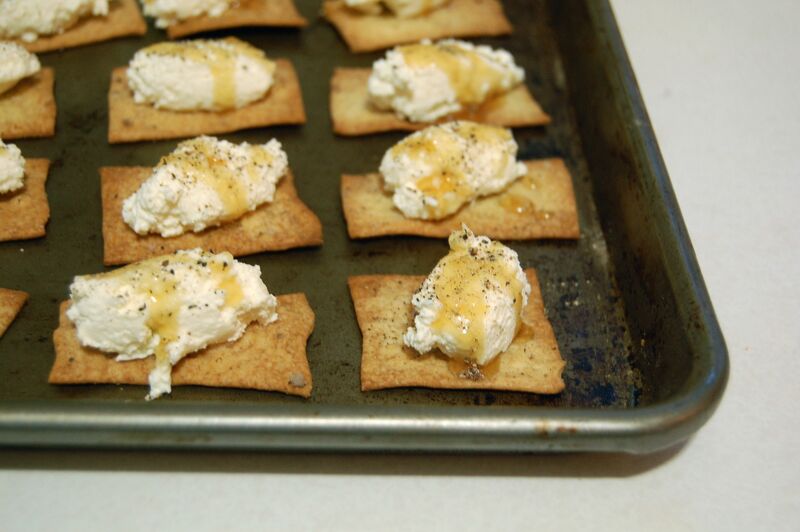 – Scoop onto a parchment lined sheet pan. Press flat with a wet spoon. – Bake for 11 minutes. – Combine sugar and lemon zest in food processor. Process for 1 minute. – Combine with egg whites in a kitchen aid bowl. Whisk well. – Heat over a water bath, whisking constantly until the egg whites reach 160 degrees. – Remove from water bath and whip for several minutes, until cool and fluffy. – Whisk in lemon juice. Ummm… I know what you’re thinking. “Brandi: It’s November, Thanksgiving time. For crying out loud, it’s SNOWING in Seattle today, and you’re talking about figs.” It’s true, I’m terribly not of the season today. 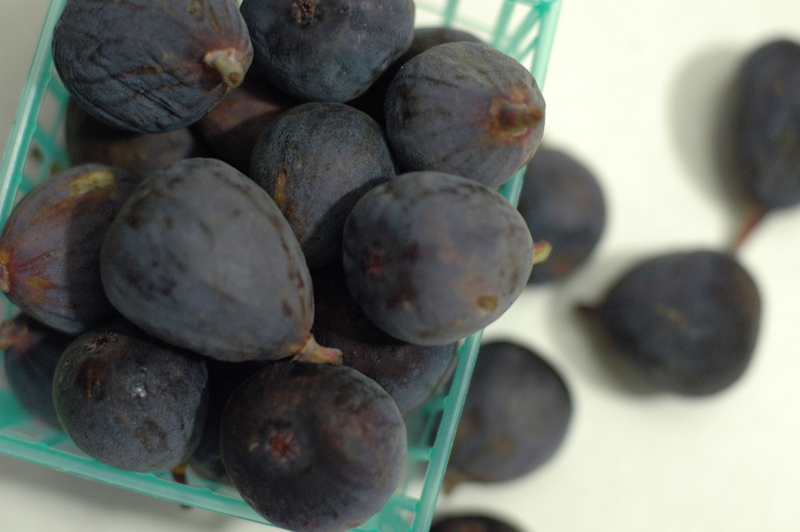 But you see, these figs — albeit from California — they were THERE. Left over from a fantastic dessert we were running at Delancey a few weeks ago, they were all lonely in the fridge, obviously uncomfortable sitting next to the pears and Meyer lemons, knowing their time was over. So I took them home to show them some respect. 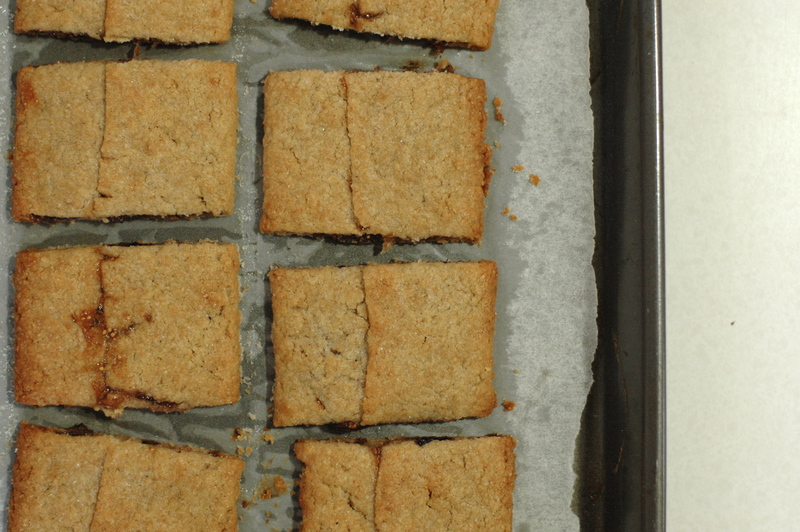 And by respect I mean I made fig newtons. Maybe I’m in the minority here, but I went bonkers for fig newtons as a kid. The Nabisco kind were regular visitors in my lunch box and I was loyal to the fig flavor, even though I didn’t know what a fig was. As my palette grew up, the fig newtons were left behind. I tried them again a few years ago and had one of those “Have these gotten worse, or am I a complete food snob now” moments. I figured their time was finished and moved on. Until this summer when Pastry Studio (my pastry blog hero) wrote about them on her blog. I bookmarked it for a later date and promptly forgot. Until those lonely little figs called out to me. First I made a food processor dough with some whole wheat flour in the mix, as well as some milk. I let the dough chill while I got to work chopping up those figs. 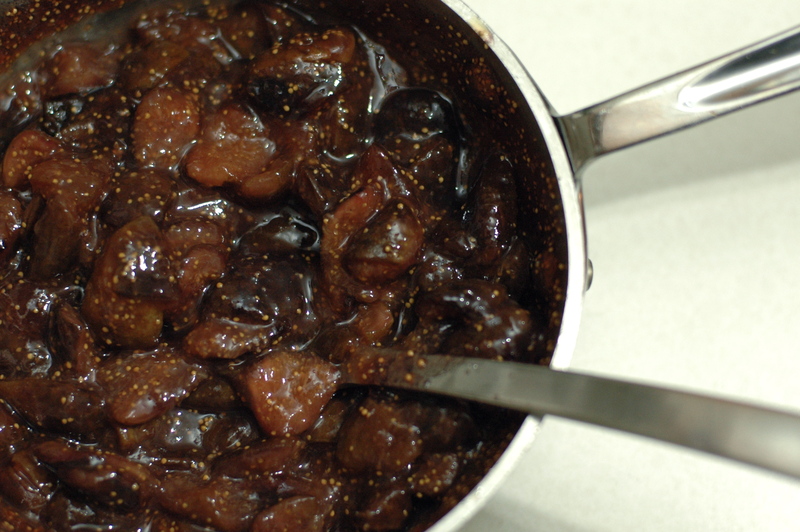 I cooked the figs into a jam flavored with vanilla bean, honey and lemon. Then several days later I finally got back around to assembling the little guys. I rolled out the dough into a long rectangle and smeared on some of the jam. I folded in the edges to enclose the jam. And sliced it into little newtons. I baked them with a little sugar on top until they were nice and golden. And then I stacked them up and took pretty pictures with Molly’s camera (thanks Molly! ), because I accidentally left mine in San Francisco. Her lens is much better than mine and I now have camera envy. 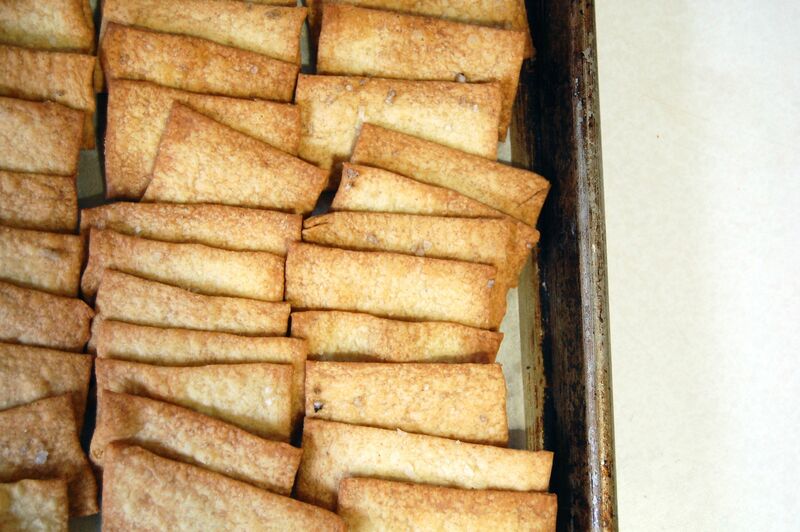 But back to the fig newtons. Oh. My. They were perfect. And that dough! Pastry studio, you just rocked my dough world. 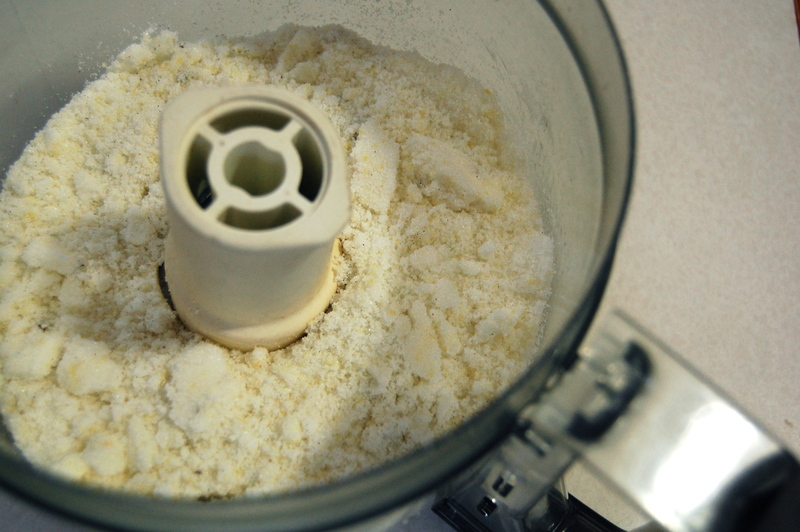 – Place the flours, sugars and salt in a food processor and process to combine. Cut the cold butter into small cubes and add to the dry ingredients. Pulse the mixture until the butter is in very small pieces. Add the milk and pulse until the mixture begins to look more like dough and less like sand. – Shape the dough into a rectangle and wrap tightly in plastic wrap. Refrigerate until thoroughly chilled, at least an hour. – Slice open the vanilla bean and rub the seeds into the sugar. 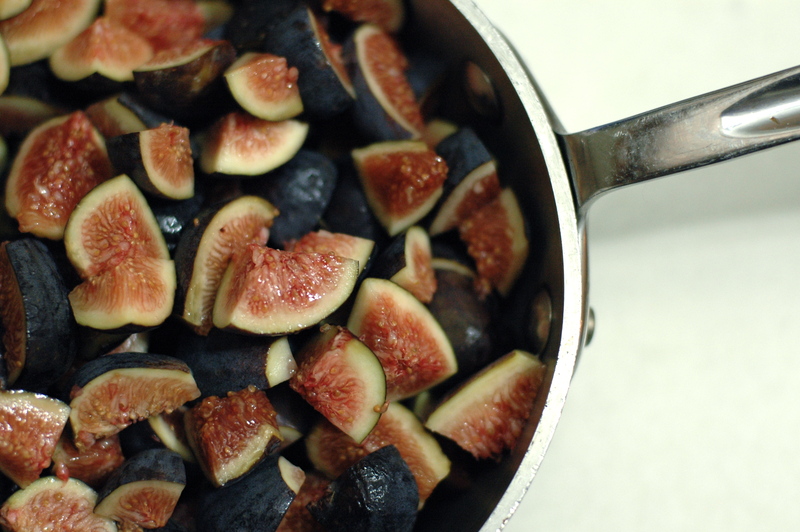 Cut the stems off the figs and chop into small chunks. Place them in a saucepan with the water, honey, vanilla sugar, vanilla bean pod, salt and lemon zest. Cook on medium heat until the mixture comes to a simmer. Lower the heat and cook the fruit slowly and gently for about 15-20 minutes or until the fruit is jammy, stirring every few minutes and adding a bit more water if necessary to prevent scorching. Remove from the heat and add the lemon juice. Remove the vanilla bean pods and use an immersion blender to pulse a few times to smooth out large pieces of fig. Store in the refrigerator until completely chilled. – When everything is chilled, remove the dough from the refrigerator and place on a lightly floured board. 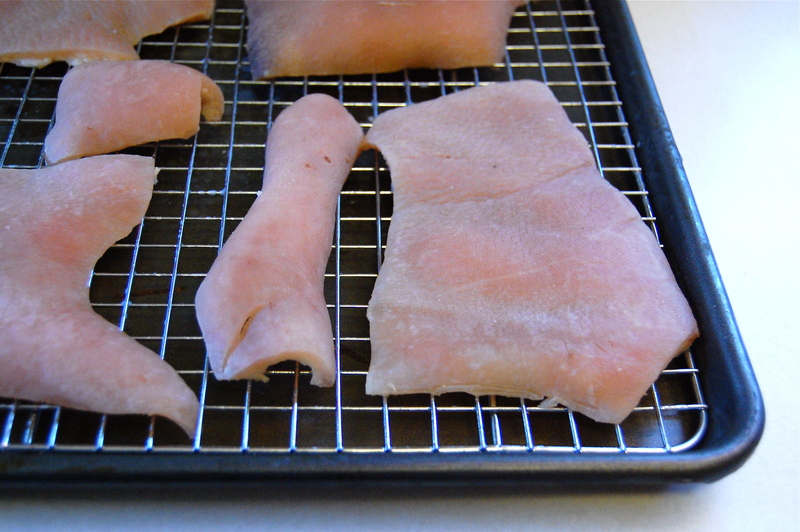 Slice lengthwise into 3 strips. Rewrap 2 of the strips and place back in the fridge. Dust the top of the dough lightly with flour and roll out to a rectangle measuring 12” x 4”. Work quickly, running an offset spatula under the dough to make sure it isn’t sticking to the board and dusting lightly with flour whenever necessary. 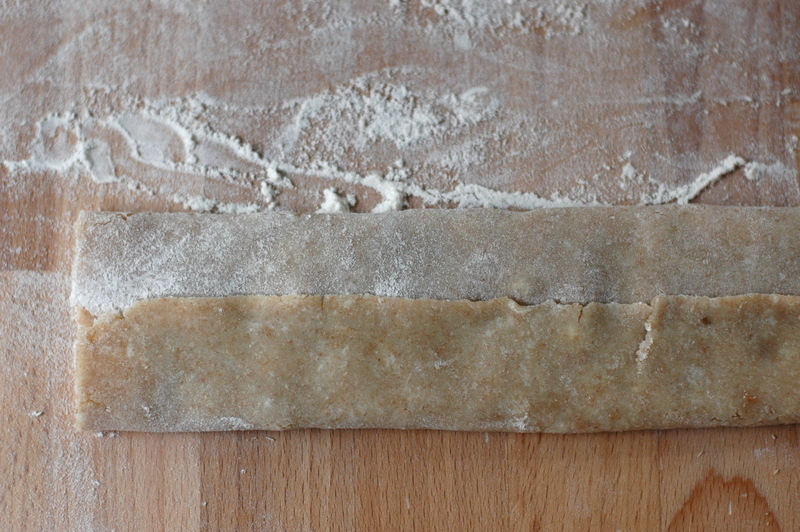 When you have the finished rectangle, place the dough onto a parchment lined baking tray in the fridge. Repeat with the other 2 pieces of dough. Chill the rolled dough in the fridge for another 10 minutes. 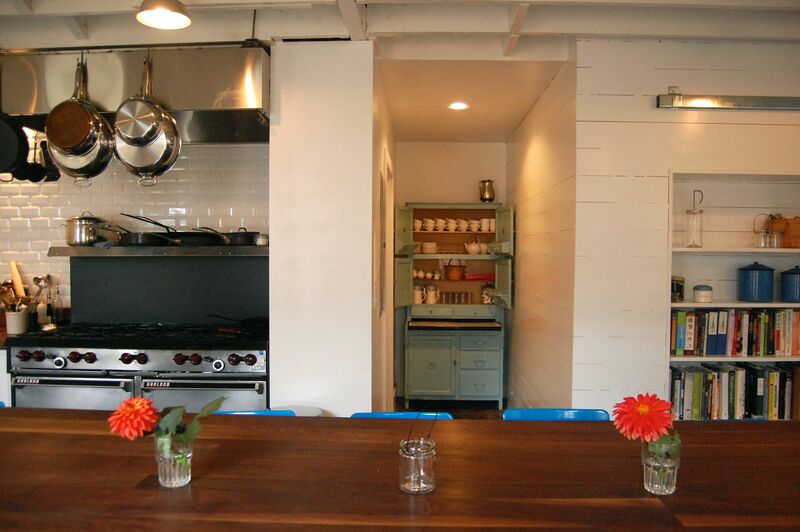 – Remove one rectangle from the fridge and lay back on the floured board. 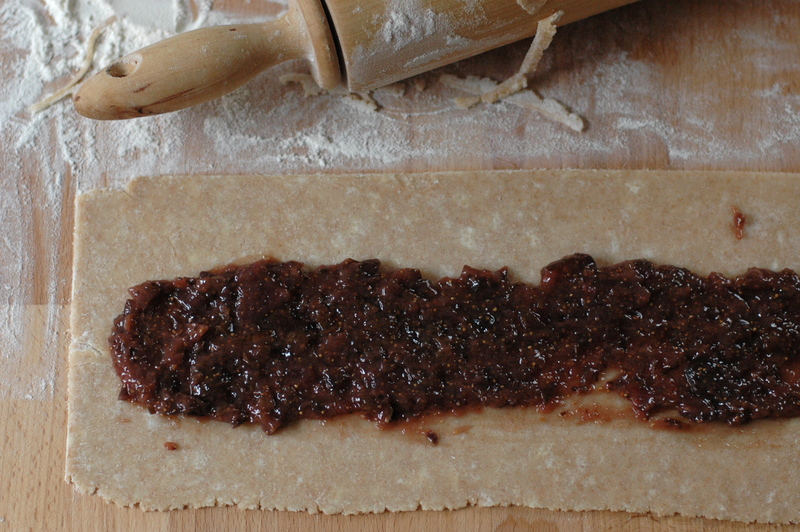 Spread some of the fig jam lengthwise along the center of the dough. Gently lift the dough sides over the fruit. Cinch the edges together to completely seal the jam. Use your hands to press down slightly on the dough to smooth out the jam within. It’s ok if some oozes out the ends. Cut into slices and place on a parchment lines sheet pan. Chill in the fridge while you repeat with the other 2 strips of dough. Once finished, chill for another 30 minutes. – Preheat the oven to 400 degrees. Sprinkle the bars with sugar and bake for about 10 minutes. Lower the oven temperature to 350 and bake until nicely browned, about 20 more minutes. – Remove from the oven and cool completely. Give me a recipe that starts with cooking oats in butter and vanilla bean and you’ve stolen my heart. Throw in some peanut butter and you’ve convinced me to make cookies, something I rarely feel inclined to do. It had been a while since I made a Nancy Silverton recipe, and now I feel the need to pull all her books off of my shelves and hit the kitchen with a vengeance. Seriously, she might be my pastry hero. Top 5 at LEAST. This cookie recipe came from her Sandwich book, a book I might never have paid attention to had it not been for her take on Nutter Butters. As mentioned above, I started by toasting oats with butter and a vanilla bean. 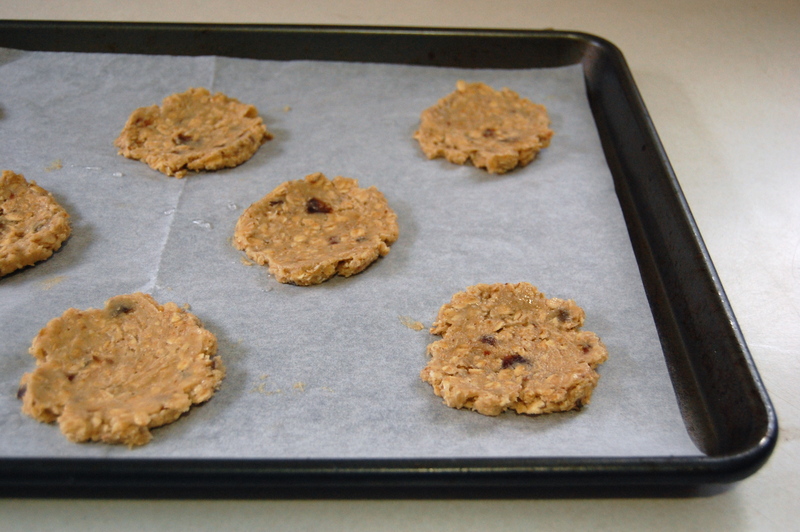 I mixed those into a pretty straight-forward peanut butter cookie dough. I rolled and stamped out little discs that I popped into the fridge to chill before baking. While those were baking I made the filling, a salty, buttery, peanut fluff. And then it was the best assembly line one can imagine. The funny thing is, these cookies actually get BETTER as they age. The first night I had them after a Monday night family dinner, with some ice cream. They seemed rich and intense, almost to the point of turning me off. I couldn’t eat a whole one and considered sending them away with my friends just to get them out of my house. The next day though, either I was hungrier or they mellowed out because I devoured one in 15 seconds flat. And they were so much more tender. So from now on, I’m making these little ones the day before I actually need them. And I’ll definitely keep them oreo sized next time. 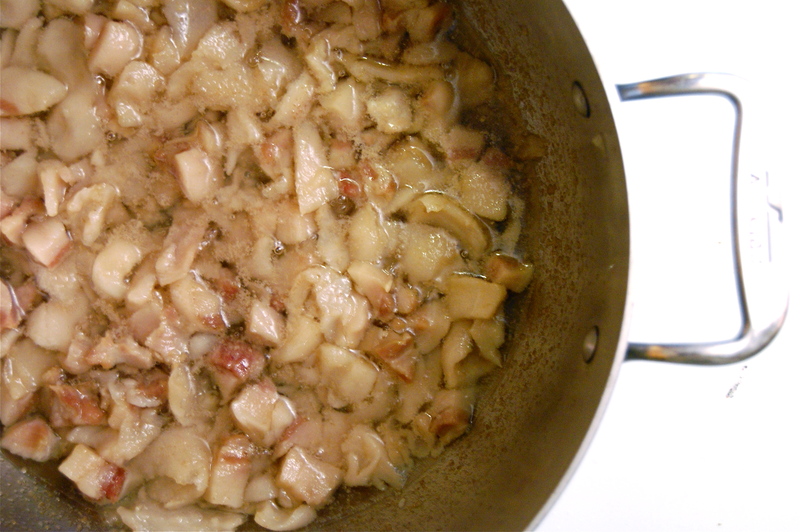 – In a medium sized skillet, melt 4oz of butter over medium heat. Split the vanilla bean lengthwise and scrape out the seeds. Toss the seeds and the pod into the butter along with the oats. Cook for 5-7 minutes, stirring constantly, until the oats are lightly toasted and golden brown. Transfer the oat mixture to a bowl, discarding the vanilla bean pod, and chill in the fridge. – Place the flour, baking soda and salt in a bowl and whisk together. Set aside. 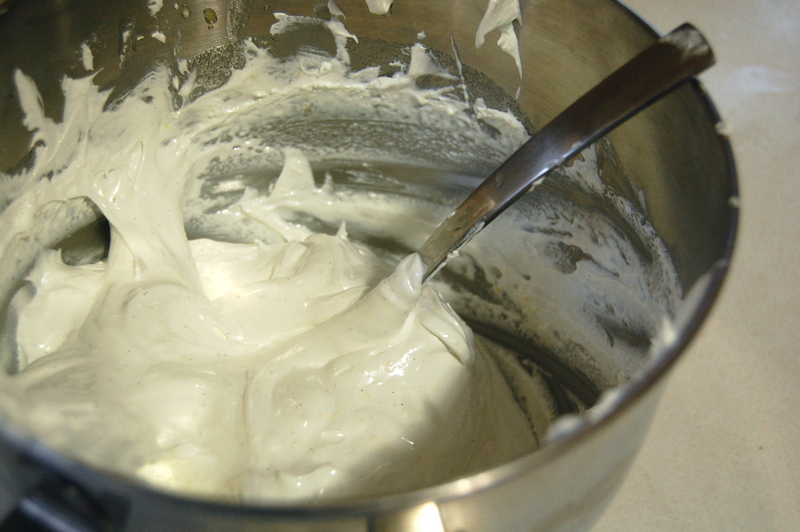 – In a stand mixer, cream the butter on medium speed for a minute with the paddle attachment. Slowly pour in the sugars and continue creaming until the mixture is light and fluffy, scraping down the sides of the bowl as needed. Add the peanut butter and mix just until combined. 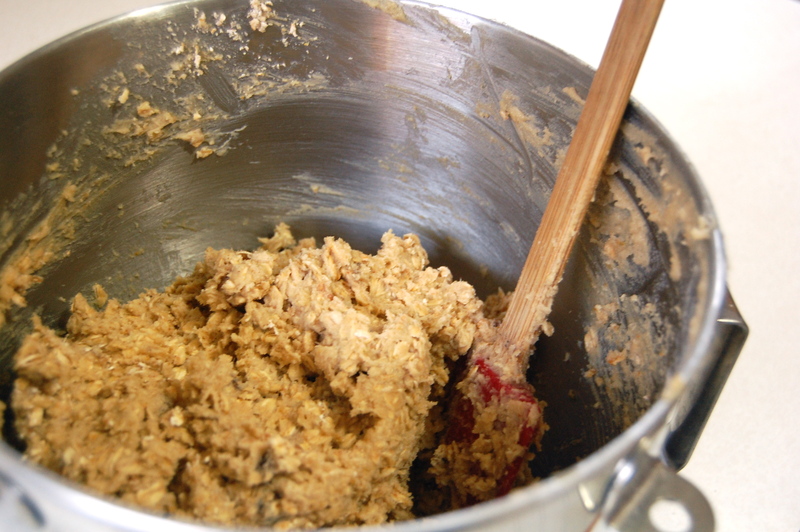 Lower the speed and add the chilled oats, mixing until just combined.Turn off the mixer and add the flour mixture. Mix on low speed until the dough comes together in a ball. 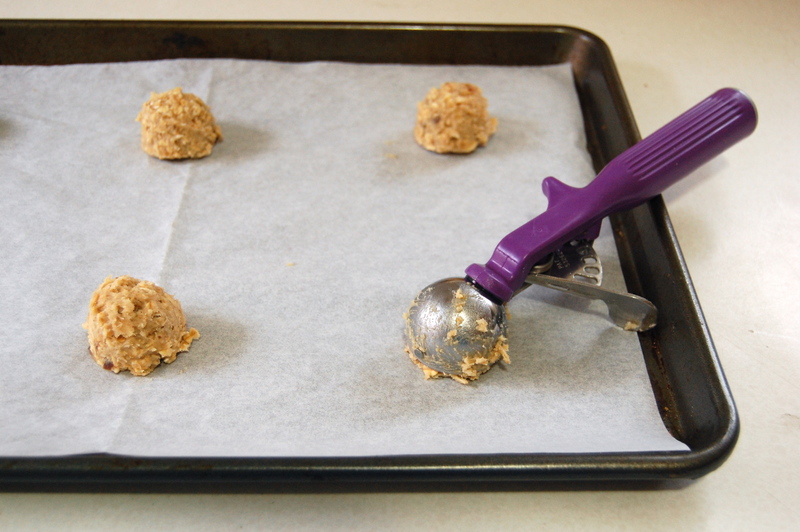 – Roll the dough into 2″ balls, or use a scooper to scoop out individual portions and place on a parchment lined baking sheet. 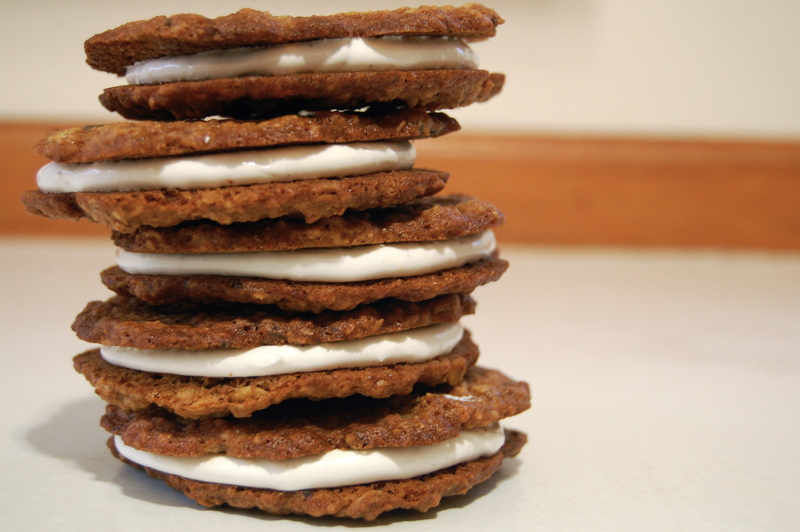 Slightly flatten each cookie and use a knife to score each cookie with criss-cross patterns. Chill the dough for about 15 minutes. – Preheat the oven to 350 degrees. Bake the cookies for 18-20 minutes, rotating the pans halfway through. They should be lightly browned. Cool completely. – In a stand mixer fitted with the paddle attachment, cream the butter and salt on medium speed for about a minute, until the butter is softened. – Add the sugar and peanut butter and mix another minute to combine. This time of year I turn into a bit of a berry monster. The first couple weeks of berry season I tend to gorge on berries until I just can’t take any more. Then I stop just long enough to panic about their eventual disappearance. In response, I make jam. Lots of jam. I’ll make so much jam that I panic again and start giving it away. Then as I work my way through a couple of jars, I’ll start wishing I hadn’t given so much away. I’ll panic yet again, and if there are still berries around at this point, I’ll probably make more jam. You know, just in case I run out in January. 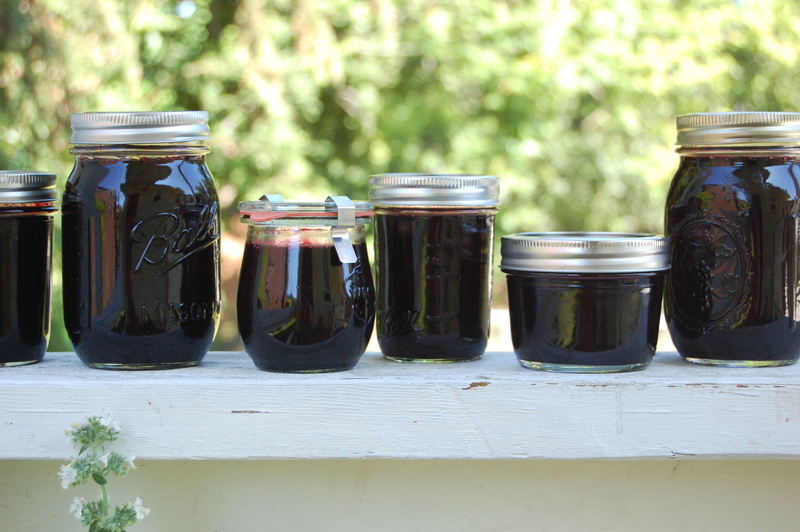 So far this summer I’ve made a sun-cooked strawberry rhubarb jam, a black raspberry jam, and now, this absolutely perfect blueberry jam. It’s so straightforward that it seems silly to even share the recipe. But that’s its genius. Beneath all that obviousness is a jam that is so perfectly spreadable and so… blue. I’ve already eaten it on toast, biscuits, crepes and pound cake. And it’s only been 4 days. Note on blueberries: With all jams, it is super important to get the best fruit possible. If you don’t want to smash your face into a pile of it, then it’s probably not jam worthy. Yes, it should be that good. I used Billy’s blueberries, arguably the best blueberries in the Puget Sound area. 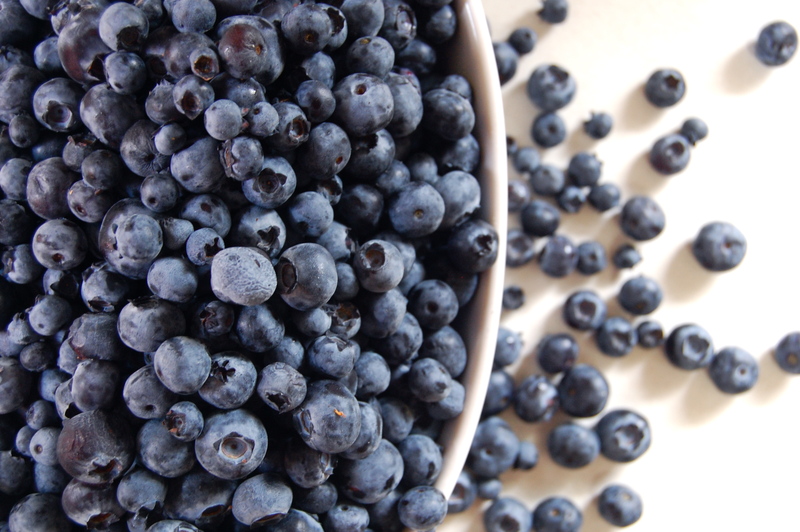 – Put the blueberries and water in a heavy pot. Bring to a boil, then cover, reduce heat and simmer for 10 minutes. The fruit should be quite soft. – Lower the heat and add the sugar and lemon juice. Stir until the sugar is completely dissolved. Turn up the heat and boil for 5 minutes. – Add the pectin and boil for another minute or 2, until it has set. I test for set by spooning the jam onto a plate that has ben stored in the freezer. I place it back in the freezer for 10 seconds and then press my finger to it. If it wrinkles, the jam is done. 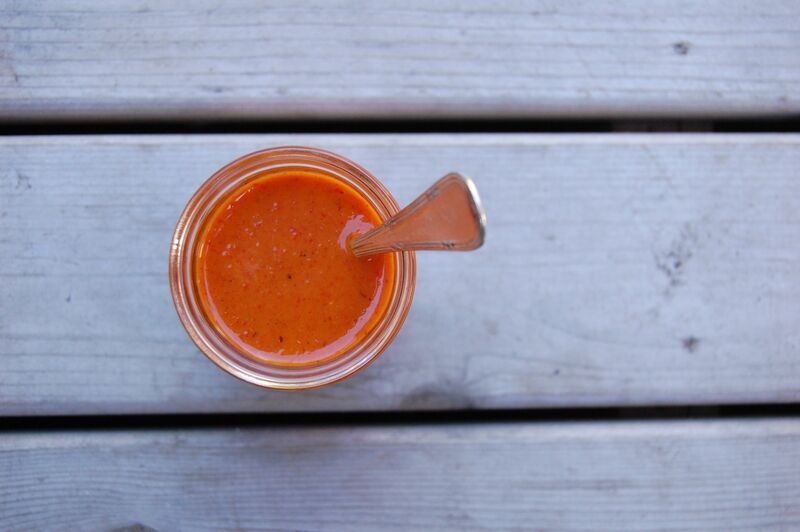 -Ladle into hot sterilized jars and seal. If you’re storing it at room temperature, it’s a good idea to process them. It’s ready to eat the next day. You did it again. You made me fall in love with you all over. It started months ago, you see. Living in San Francisco. There was this guy, Ryan Farr his name was. He was making magic with pork skin, and his chicharrones were showing up all over town. I was deeply jealous. I hated him for knowing you in a way that I didn’t. 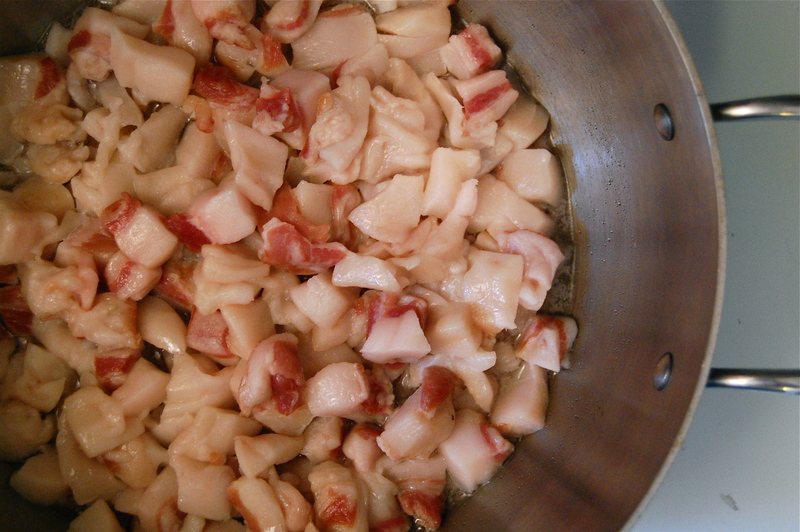 I mean, I grew up in ALABAMA – I should be frying pig skin in my SLEEP! Why wasn’t I grandfathered in on the secret? And rumor had it that this Mr. Farr was taking his technique with him to his grave. So I was on my own to find my way into your heart/skin. All hope was seemingly lost, months of searching were fruitless. But then it happened. I read somewhere that the new Momofuku cookbook was spilling the beans. 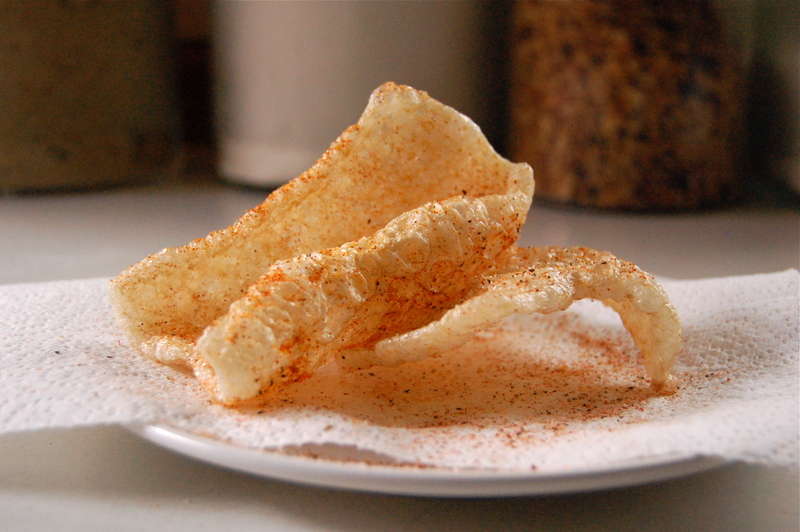 Step by step directions for perfect chicharrones. I ordered some fatback from my new favorite butcher shop and left the house 5 minutes later to buy a copy. There was no stopping me now. When my fatty skin came, I was enthralled. You looked so innocent, like a topographical map of a Washington state. I could have stared at you all day, folding you into different shapes. But we were at the beginning of a long journey together, so I needed to get to work. First I separated your skin from your fat. 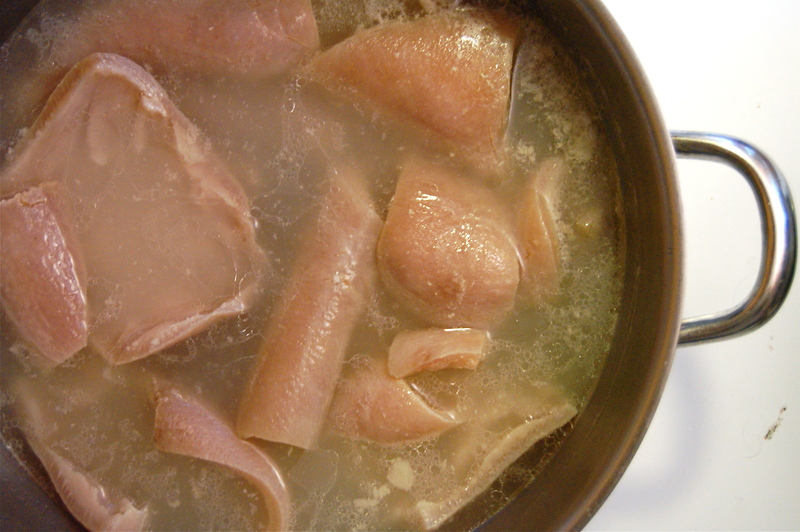 I put your skin in a pot of water and boiled you for 1 1/2 hours, long enough to soften up the fat left clinging to you. The rest of your fat I cubed up and put in another pot, with a bit of water. Because when you have that much fat sitting on your kitchen counter, you might as well render some lard. 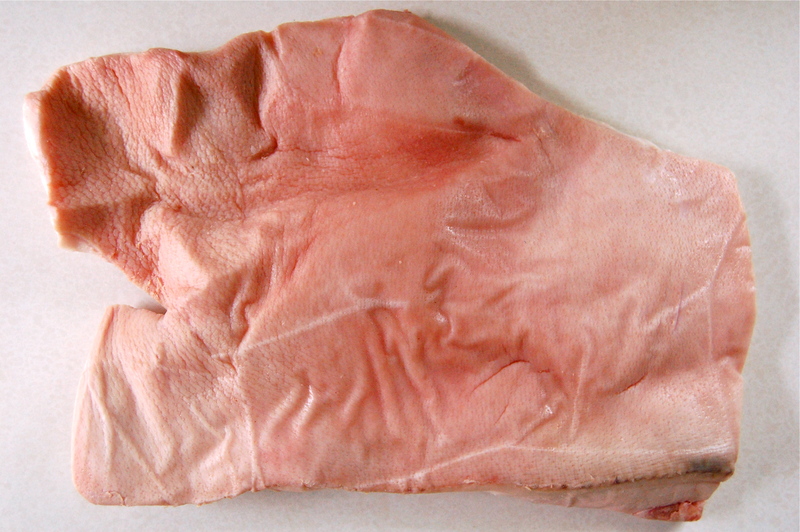 After your skin was done boiling, I stretched you out and placed you in the fridge. There you chilled for another 2 hours. Then I set about the arduous task of scraping off every last bit of fat. The book recommended the side of a spoon, but I had to use a knife. Because this was OUR moment and I wanted you to be perfect. Then I popped you in the dehydrator and let you do your thing overnight. In the meantime, I still had some fat melting away on the stove. It took 8 hours, but eventually you released all your juiciness. I strained you, smashing to get every last drop of liquid fat. And was very pleased with your color, almost perfectly clear. When you cooled, you were beautiful. Snowy. Pure. I slept well, knowing that when I awoke the next morning, you would be ready for me. And you were. 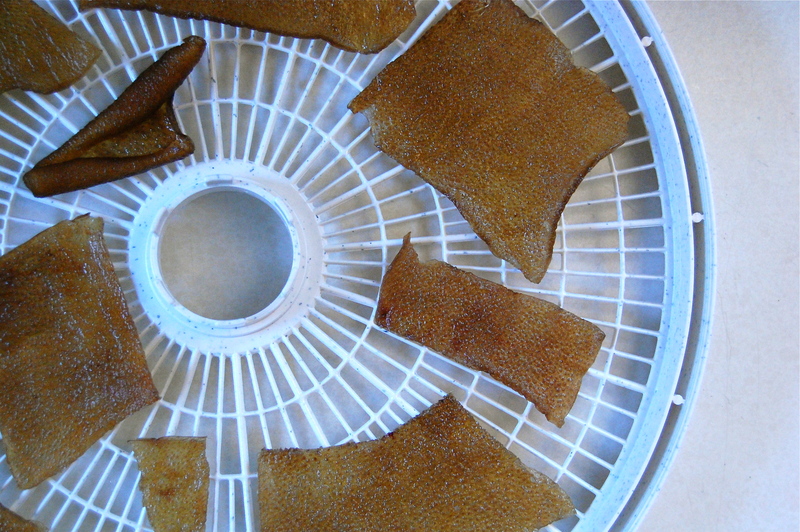 12 hours in the dehydrator had left you thin and leathery. I broke you into tiny pieces. 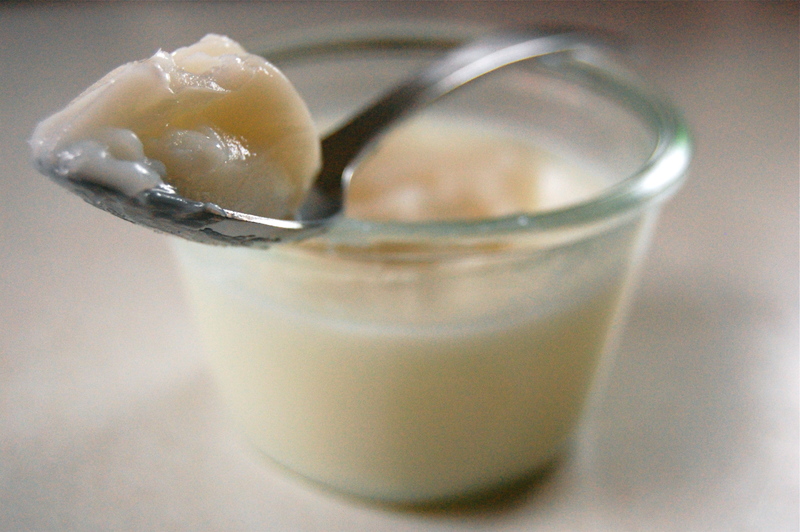 I heated your lard to 390 degrees and tossed in your skin, one piece at a time. It was magnificent to see you puff up to 5 times your size. I like to think that was you swelling with love. I tossed you in a spice mix I had prepared earlier. And you were glorious. Light, fluffy, melt in my mouth glorious. 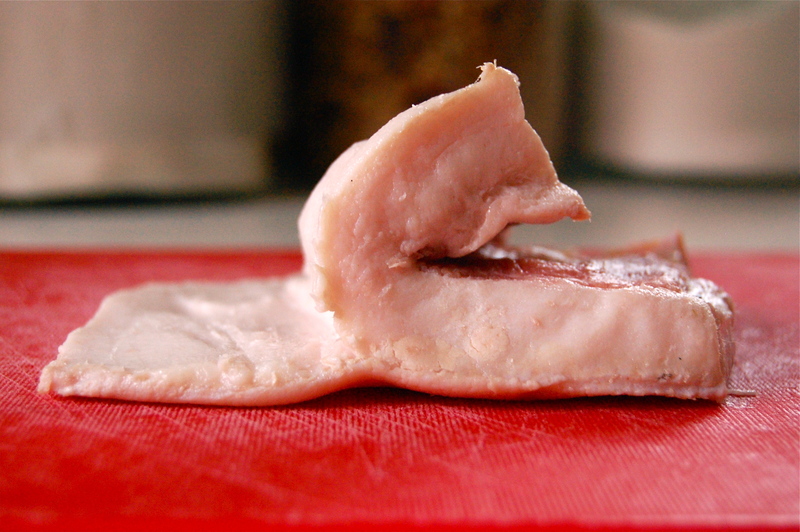 You were a lot of work, but Pork skin, you were worth it. Thank you.